Da Bears Blog | Should the Green Bay Packers sign Steven Jackson? Should the Green Bay Packers sign Steven Jackson? Green Bay’s offensive hallmark in the last five years has been their passing game, which makes perfect sense when you consider that they have an all-time great quarterback in Aaron Rodgers. However, two successive playoff failures have made many think that Green Bay, which has not had a rusher go over 750 yards since 2009, needs a feature back who can give them a solid running game. Many fans are looking longingly at free-agent running back Steven Jackson, who has been a very good running back on many very bad St. Louis Rams teams in the last eight years. ESPN NFL analyst John Clayton has also publicly stated that he thinks this would be a great idea, suggesting that signing him for $5 million would be a great deal for the Packers. On the surface, this move makes perfect sense. Putting a dangerous running back in an offense that is already explosive can only help improve it. But is this actually the case, and would such a hefty investment be worth it for an older back? Steven Jackson has already played eight years in the NFL, and he has almost 2400 career carries. That’s some serious mileage, and it’s fair to worry about diminishing returns once a player has taken that many hits. Let’s look at other running backs in the last twenty years who have more than 2400 carries, and see how they fared. Looking at the table, it’s hard to think that signing Steven Jackson would be a good idea. 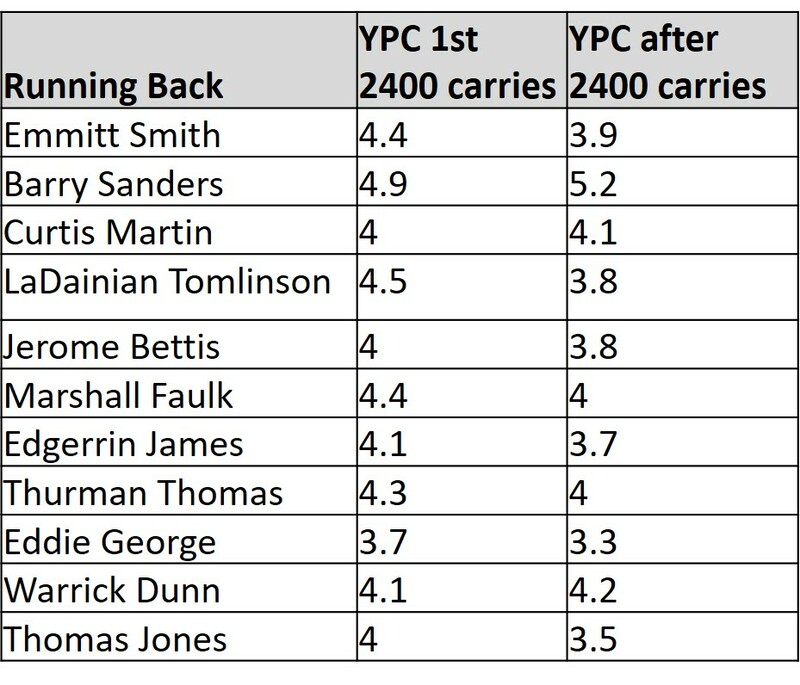 Only three of the eleven backs in similar situations to him improved their production after 2,400 carries, and one of those (Warrick Dunn) did so in an extremely limited sample size (186 carries). Of the 33 100-or-more carry seasons by these backs after they had ,2400 carries, only seven (21%) averaged better than their first 2,400 carries. By contrast, nineteen of them (58%) found the backs performing at a clip that was at least 0.3 yards per carry worse than their average from their first 2,400 carries. To put these numbers in perspective, Steven Jackson has averaged 4.2 yards per carry in his career so far. Based on historical numbers, then, he would have roughly a 20% chance of averaging 4.2 yards per carry or more for the Packers, and close to a 60% chance of averaging 3.9 yards per carry or less. There were 31 NFL running backs who had 100 or more carries while averaging 3.9 yards or more in 2012, including five rookies, four of whom were drafted in the third round or later. Given Green Bay’s cap situation, and looming extensions for Clay Matthews and Aaron Rodgers, it makes far more sense for Green Bay to invest in a young running back in the draft than spend big money bringing in Steven Jackson. Having a middle-round pick to pair with DuJuan Harris, who came on strong for the Packers late in the year, is a far cheaper investment that also carries with it less risk. Steven Jackson could end up being the next Curtis Martin, who had three very good seasons after amassing 2,400 career carries, but the odds are much greater that his production will fail to live up to his reputation (and corresponding price tag).